Rinne, a strange, long-absent student, finally shows up at school. The two investigate a cycle of bizarre phone calls, a Chihuahua and a lonely ghost. Sakura follows Rinne into the other world again. But accidents happen, and Sakura finds herself stranded in between worlds, and in danger of moving on to the next. Sakura’s friends are sighting strange lights at the school’s old club building. The place is certainly creepy, but it holds a lot more than Sakura, or even Rinne, thought. A new transfer student causes quite a commotion when the first thing he does is ask Sakura out! Lucky for him, a spirit’s regret initiates a double date! Rinne is excited to hunt down an evil spirit for a huge bounty, and the school becomes haunted by a spunky little ghost bent on revenge, he finds a lead. While walking home, Sakura hears the voice of a child calling for help from a roadside shrine. It may be linked to Rinne’s most recent client, who has a serious cat problem. A strange bat-winged guy is swearing revenge against Rinne. The demon’s using innocent students in his plans, including a boy who is in a coma! Episode 8: Welcome to Hell! Rinne has no choice but to enter Hell illegally as he tries to save Reiji's soul from the hands of the demon Misato. It’s the school festival, but Rinne and Sakura have more to worry about than their class café; a wig has been possessed, and a strange pumpkin is speaking. 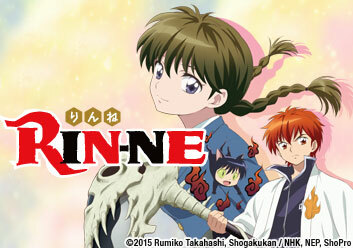 Coinciding with the onset of an otherworldly flu, the truth behind Rinne’s debt is revealed with a poorly timed visit. Episode 11: The Young President’s Induction?! Sakura and Tsubasa are still stuck in the Damashigami Company. To escape and collapse the company, Rinne will have to challenge its leader. An eerie pencil leads Rinne to a Damashigami hideout, but on the way he meets a girl whose sole job is to fight Damashigami! A shifty scheme ends up putting Sakura in danger, but the real danger lies in her misunderstandings about Ageha and Rinne! Episode 14: It’s Not a Date! Haunted by the image of Rinne and Ageha, Sakura doesn't tell Rinne about an idol spirit near an amusement park pool. However, there's more than just one spirit at the park. Rinne is convinced Sakura has the wrong idea about his "relationship" with Ageha, and he's brutally interrupted every time he tries to talk to her. Sakura accompanies Tsubasa to visit a tree that holds fond (and different) memories for the two of them. But something about the tree has changed just as much as they have. Tsubasa is tired of Rinne getting between him and Sakura. The demon Masato has a way to remedy this, and Tsubasa may be unable to refuse. A Shirushigami named Kain sees Rinne’s father and the Damashigami Company liable for his family’s poverty. Viewing Rinne as a Damashigami conspirator, Kain is bent on payback! With the pull of the afterlife growing stronger and stronger, Rinne continues to fend off Kain as he, Sakura and the others try to find his life flame. Sakura’s used to seeing spirits, but her house was always spirit free. Suddenly, the place is full of them! She asks Rinne for help, but Tsubasa and Ageha make it difficult. A mystery unfolds around the disappearance of the Mortal Census Bureau’s bonus money. Kain instantly blames Rinne, but it could be a more hellish perpetrator. A house decides to celebrate Christmas on its own, but has a special way of drafting help. Ageha’s gullibility leads to a surprising Christmas Eve for the group! A nine-tailed fox is causing problems! Taking advantage of Tsubasa’s cold, the fox aims for revenge against Tamako’s descendants, including Rinne! A ramen shop opens near the group’s school and Rinne is requested to help with the possessed chef! However, this possession may be an improvement for all involved. Sakura has unwittingly become the target of an evil spirit competition. An experimental candy has removed her ability, and Rinne must protect her from what she can’t see!